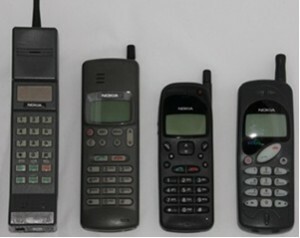 This is a list of Nokia phones, by product group, for the UK market made from the 1980s to the first half of the 2000s. 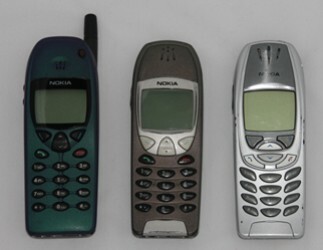 Initially Nokia phones were very similar to those of other manufacturers. The vision of Jorma Ollila, Nokia's CEO, and of design consultant, Frank Nuovo, saw Nokia anticipate the path of the fledgling mobile industry in the early 90s. The result of this collaboration was a gradual expansion of Nokia's range to cover many different types of user. There was very little strategy, design or marketing applied to early mobile phones. However, with the involvement of Frank Nuovo, who started as a design consultant with Nokia in 1989, the Nokia vision began to be realised. Of the analogue phones, pointers to the future can be seen in the Nokia 101, which was all about ease of use over features and small size. Later Nuovo designed the 232, a consumer phone with bags of style. Nuovo called it his Ferrari phone. The Nokia rinGo, marketed as a cheap, easy to use phone for the Swedish market took the concept of simplicity too far. It was the Nokia "Bimbo" alienating female consumers. But the rinGo had a new lease of life as the UK's first PAYG Nokia. 1996 Nokia 909 Candybar Basic analogue phone, more advanced than the rinGo. Nokia moved into GSM with commitment. Ollila realised that GSM would eventually eclipse analogue. Early GSM phones were upgrades of analogue designs, but a distinctive Nokia feel emerged with two classic designs, the 2110 business phone and the 1610 consumer phone. Both achieved a long production run and a loyal following. 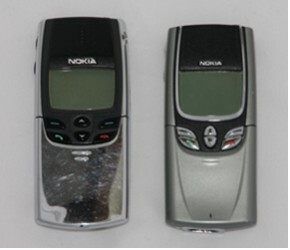 The beginning of the Premium category can be seen with the 8110, which took mobile phone design in a new direction. 1996 Nokia 8110 Slide The classic 'Matrix' phone; superb design by Frank Nuovo. Product categories were a key part of Nokia's marketing strategy by 1998. 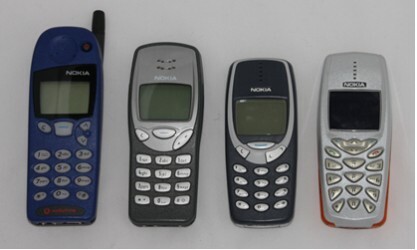 The main categories were Expression (basic phones with customisable fascias and ringtones), Classic (business phones), Fashion (top range consumer phones emphasising coolness and style) and Premium (top range business phones emphasising status). It is hard to be certain when Nokia first started using these terms internally and the categories were fluid, with some phones moving down a category as they got older and less desirable. Nokia added more categories in the early 2000s, Entry and Active. Entry was all about cheap phones for first time users or people who wanted 'just a phone'. Active phones were tough phones for sporty users or builders. Premium phones were the the very best that Nokia could offer. They brought the status of luxury watches and sports cars to mobile phones. They were meant for top executives and wealthy individuals. The origins of the Premium range is probably in the 8110, which emphasised high quality design, though the Premium sector was more about "bling" than understated good design. The first true premium phone was the 8810 which brought a shiny chrome look to the black and grey phones of the era. It was no co-incidence that the model number began with 88, given the significance of 8 in Asian culture. The range included a gold plated version aimed at the Hong Kong market. The Fashion category phone were about style and coolness. They were top end consumer phones with the latest features, but chic rather than geek. Fashion phones offered bags of style, they were small, light and good looking. Whilst the original fashion phones, the 8000 series, targeted both male and female consumers, the later fashion phones, the 7000 series, began to be slanted more towards women. Nokia introduced two ground breaking phones with 7000 series numbers, the 7110, Nokia's first WAP phone and the 7650, Nokia's first camera phone. These phones did not belong to the fashion category. Classic phones were business phones offering conservative styling and advanced business features such as tri-band GSM and infra red and Bluetooth connectivity. They targeted business users who valued efficiency, productivity and compatibility with older phones. Nokia called this market segment Controllers. These phones built on the success of the 2110 business phone and were a continuation of that phone's core user base with top end users moving up to the Premium category. Although some Classic phones earned a similar status, if not even greater status, by their usability, modest styling and feature set. The 6310 inspired a loyal customer base who wanted to continue using this phone long after other designs had surpassed it. Expression phones were about simplicity and personalisation. They were targeted at a market segment Nokia called 'Balancers'. Balancers valued family and the important things in life. They wanted phones that were easy to use and quick to master, but offered some amount of personalisation. Later Expression phones targeted the youth market and basic phones such as the Nokia 1100 were for people who just wanted a phone. Wikipedia refers to these phones as 3000 series phones. Whilst the 5110 may not have been called an Expression phone when it was launched, it had most of the features of the Expression category: customisation, easy and intuitive operation and a basic feature set. The 3110 from 1997 does not belong to this category, it introduced the intuitive Navi-key, but was a business phone and closer to the Classic category in terms of end user profile. 1999 Nokia 3210 Candybar First of the 3000 series phones; built in aerial. At the bottom of Nokia's was the Entry category. 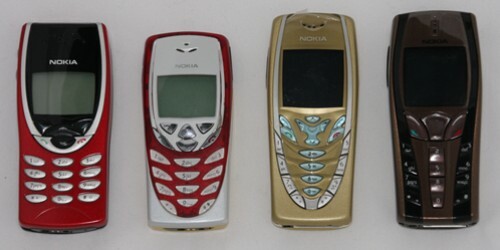 The Entry category proper started with the 1100, although later marketing literature puts the 3310 in the basic category. I bought my first cellphone in 1998; it is as a Nokia candy bar style, black. I don't see the exact model here, but one extremely similar. Perhaps European models were different. What I'm looking for is a crazy ringtone called 'Morning Driving'?it's a riot. I have not found it online ANYWHERE! "I have been trying to resetting my Nokia lumia 800windows smartphone, l keep failing to login to account.